I just got the frame and was doing a full inspection and cleaning after tearing it down. It came with a 130mm dropout spacing so I'm thinking it was caused from cold setting. I checked the alignment of the frame with my park tool alignment gauge and it is aligned to within 1mm. Dropouts are aligned as well. Paint is in pretty good condition over all, but not perfect. Not expecting a show bike just a structurally sound one. Any reputable frame builders in the Southern California - Los Angeles/Orange County area? Most of the bike shops i frequent either want to sell you a new bike or had forgotten that bikes were once made of steel. While this "crack" (not even sure of that yet as paint cracks at joints too and rust follows) might have been caused by spreading the rear end a well brazed bridge almost never has issues with 5-10mm of added spread. 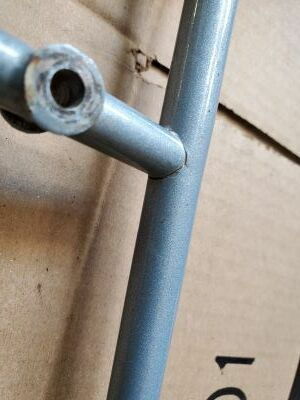 Over in the classic and vintage section of Bike Forums there is a Trek frame that was spread from 126 to 139 and the brake bridge clearly separated from one of the seat stays. Make sure your repair man takes the bridge off so it can be cleaned internally which will allow an internal fillet to happen on the inside as well as outside. If it was me I would replace the bridge so the seat stays don't[ have to be bent at the bridge so the dropouts can be at 130. 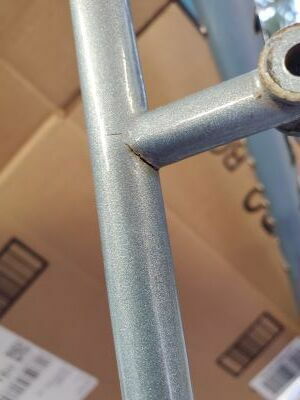 A little more worrisome on your frame is that it looks like their is a crack in one of the seat stays too. 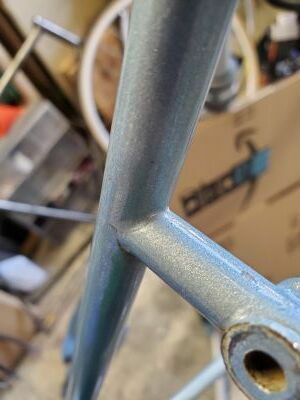 A little more worrisome on your frame is that it looks like their is a crack in one of the seat stays too. The finishing on those bikes was all done with air tools, and it could be a bit heavy-handed. They might have thinned that seat stay too much.